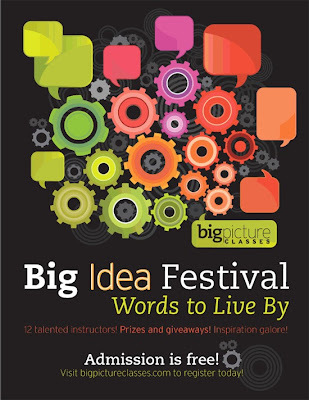 Guess where we'll be on September 16, 17 and 18th? 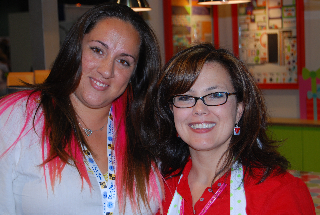 We'll be at Mall of America having fun with thousands of scrapbookers at Scrapfest 2011!! Join us? from your favorite manufacturers (Doodlebug of course....check out our monster card). With admission, you get access to dozens and dozens of free Make & Take projects, throughout the Mall of America! You'll get the chance to interact with representatives from your favorite brands and try their latest products while you make a really cool project! For more information about attending, visit their website. ...all our classes sold out so quick - thank you!! But we still thought it would be fun to share with everyone the cute classes Cynthea will be teaching at Scrapfest. If you are one of the lucky ones that is attending one of these classes, you can find your supply list on these links too. 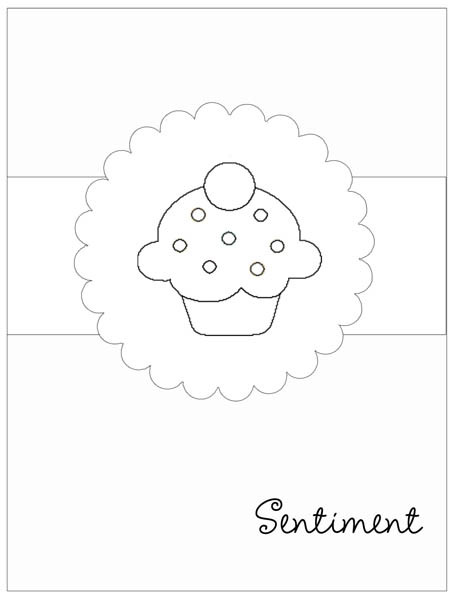 Create a bunch of fun birthday cards (both boy and girl) to send to family and friends! 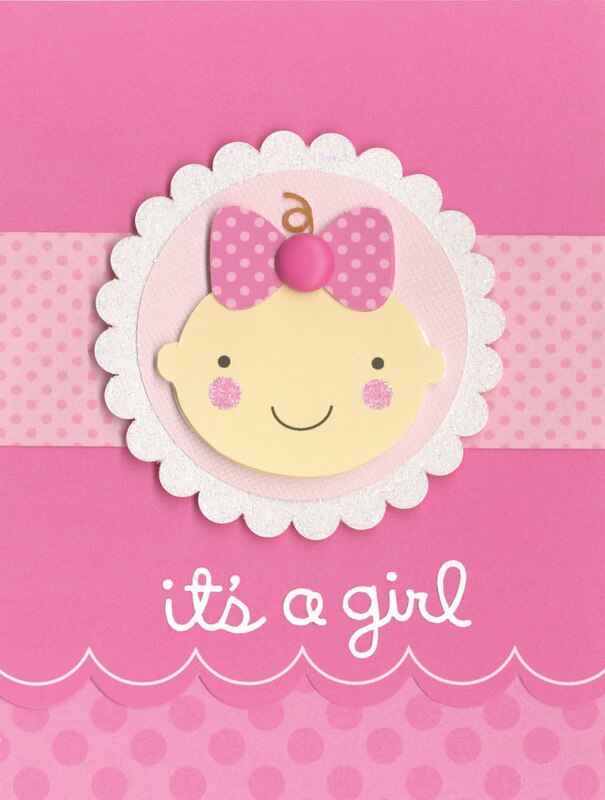 You'll start with colorful, shaped cards from the Create-a-Card system and embellish with birthday-themed papers, stickers, and more. You'll even get matching envelopes to take home, too. Come and see how fun and easy card-making can be! This mini album is sure to make you smile! 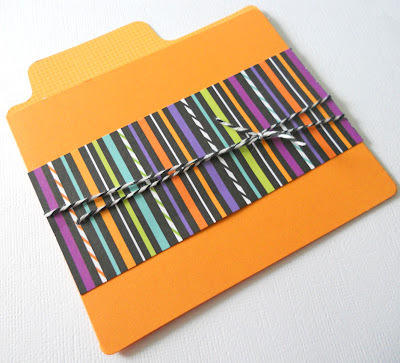 Join us to create an adorable album using ten shaped cards from the Create-a-Card system. It's full of fun flaps, pockets, and more! 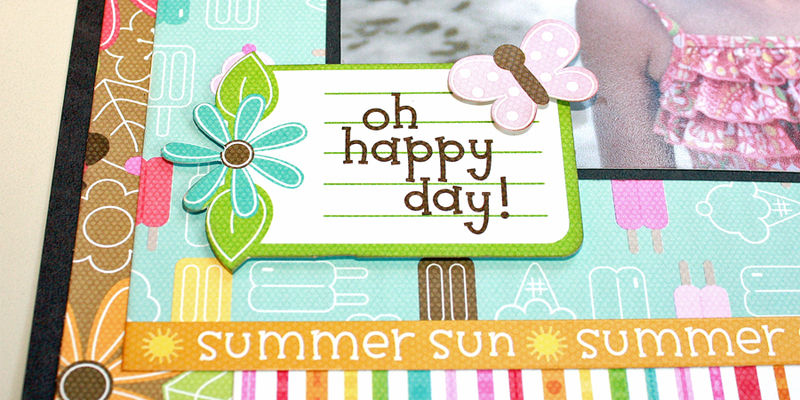 Bind together the cards and then jazz it up with papers and embellishments from the bright Ladybug Garden collection. So fun! Be sure to stop by our booth and say HI and let us know you read about the projects on our blog!! 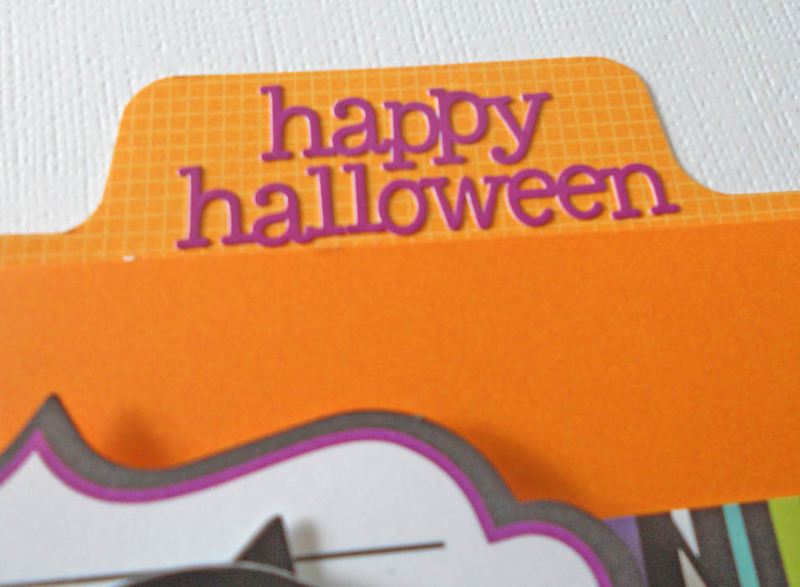 Did you see this darling card on our blog yesterday featuring the Monster Mania Collection? 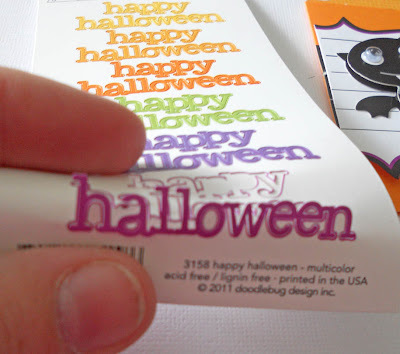 Well we thought we should share a fun tip on how to use the these fun Doodles cardstock stickers. And even though we're just showing you the three Happy Halloween stickers, but did you know we have a total of 33 of these fun stickers in 11 different sentiments. 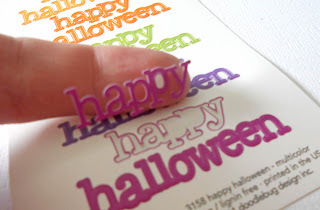 They are the perfect size for our create-a-card options. Since these are so thin on the text, you want to be very careful pealing them off the backer sheet so you don't rip them apart. And trust me, we've learned the best way to do this. 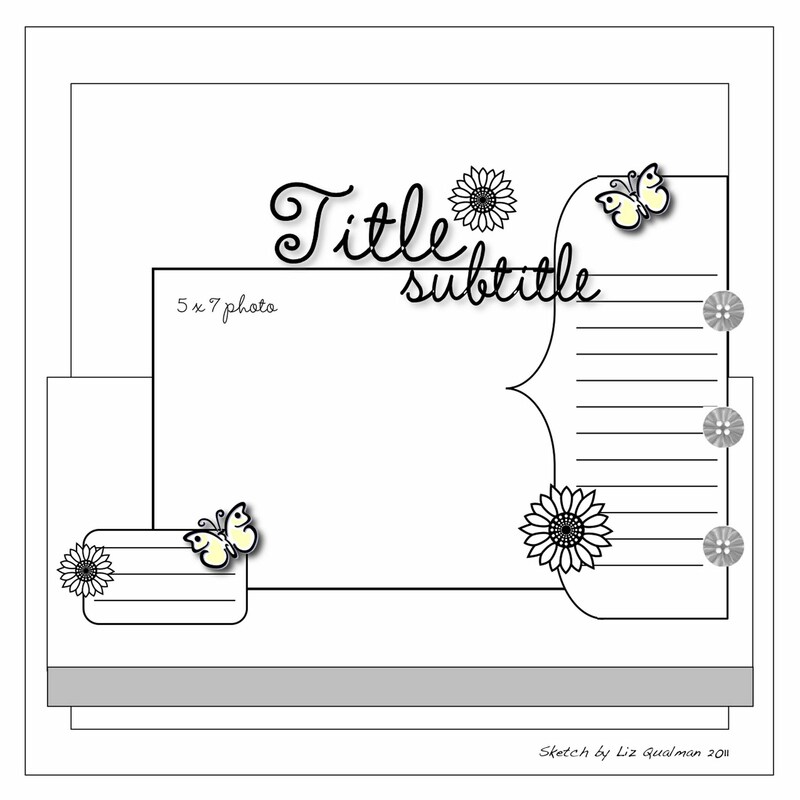 First you're going to select the sticker you want and then fold the backer sheet backwards behind the word until the top of the word starts to lift up like this example. Here's a better photo showing the sticker start to lift all the sheet from bending the backer backwards. Here we've continued on by lifting the word "happy" the same way...bending the backer sheet backwards until the upper part of the word starts to lift. Then carefully lift the word off the sheet like this. To remove the center of the letters simply touch the sticker and press and then pull the center out. 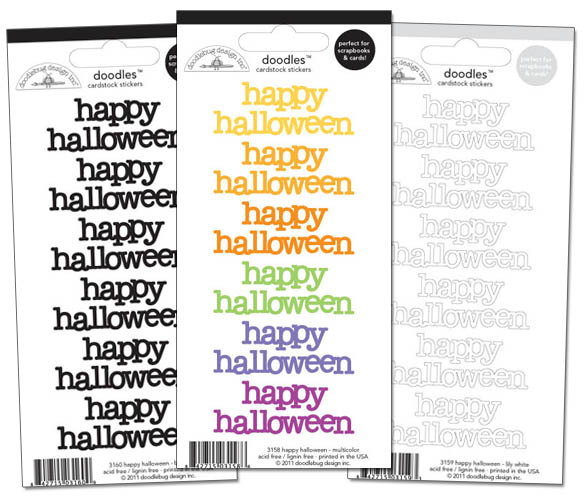 Hope this helps to save you from ripping these fun little Doodles cardstock stickers! We've received many emails asking if you could still submit your application on the 30th (today). YES! You have until 11:59pm MST today to still send us your samples and application. We will be working all weekend to figure out our team so we can announce the finalists soon. Thank you for all who have submitted applications, we've received a lot and have enjoyed seeing your beautiful work. I loved this cute little Doodle-pops from the new Monster Mania Collection when I saw them being built, then again on the CHA display...but holding them and being able to play with them and create something is another thing entirely. 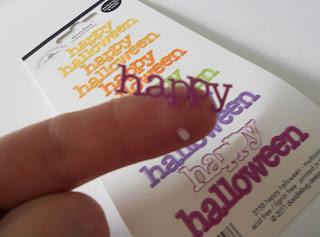 The glitter details, google eyes and layered pieces in one little sticker so you can buy one or 10. Can I just say I adore these and want a bunch more!! So I pulled a few more coordinating products from the Monster Mania Collection: #2839 tangerine Square Grid Card, #3045 Batty Doodle-Pops, #3158 Multicolor Halloween Doodles, #2994 Beetle Black Doodle Twine and a die cut from the #3103 Monster Mania Cute Cuts. Cut a 2 x 4 3/4" strip of #3062 Monster Stripe paper, wrap with the doodle twine twice and glue to center of card. 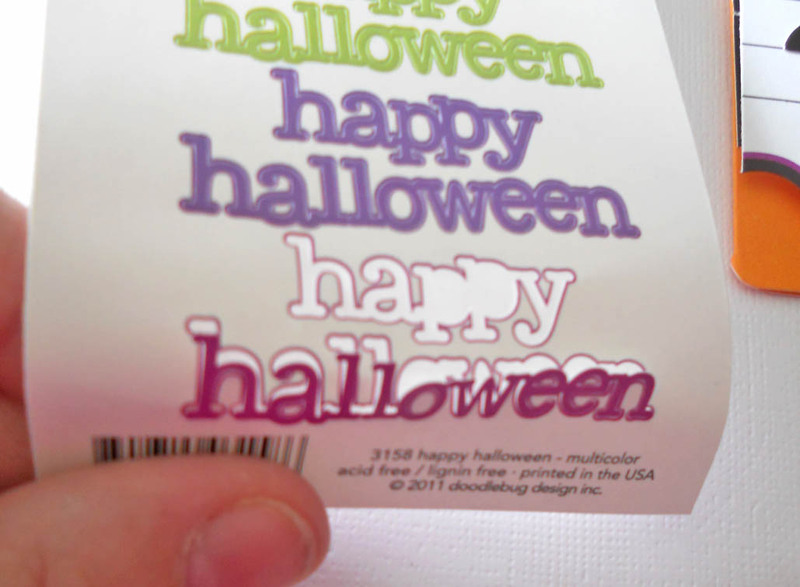 Then assemble your card to look like this...cute and only took me about 3 minutes to make!! 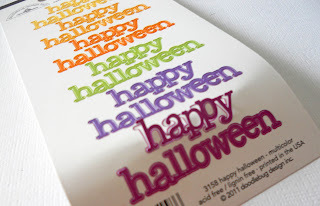 A simple trick that I did was flipped the cute cut die cut upside down and trimmed off the treat/bag image. 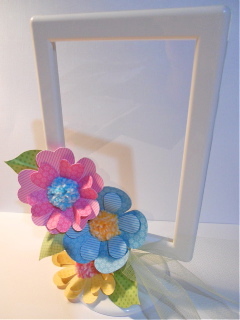 I then applied foam squares to the backside to pop it up a bit more and there you have it...a simple, cute card!! Come back tomorrow and I'll share a tip with you on how to use the darling Doodles stickers!! 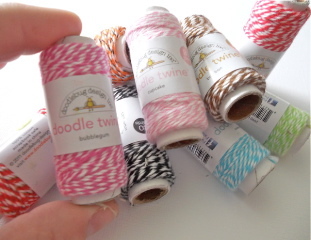 Our good friends at Scrapbook & Cards Today are offering this yummy Doodlebug Twine Giveaway...go check out their blog for details. We'll announce the winner here on our blog on September 1st!! Find all our current blog badges here. We love our name in print!! 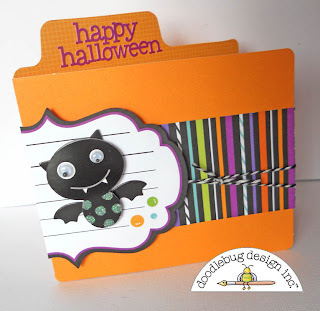 We'd love to see your Doodlebug projects...please feel free to post your projects on our Facebook wall. We just started shipping the new Monster Mania Collection this week - we're so excited and wanted to celebrate with these fun blog badges and a giveaway (details below)! Aren't these little monsters super cute? 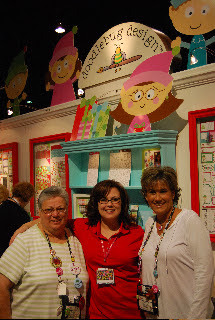 We wanted to inspire you to be a #1 Doodlebug fan by telling you about three of our BIGGEST fans ever!! 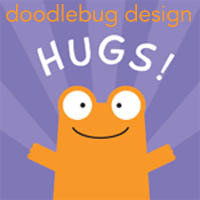 First, Cathy has been crazy about Doodlebug since we met her about 7 years ago. She told us that she buys 3 or 4 of everything we make, but hesitates using it unless she can replace it because she just can't live without it. We'd have to say that she is probably is our biggest fan! She comments on the blog and facebook page frequently and really is so very supportive!! Next is Evelyn. She is a friend of Cathy's. We haven't know her quite as long, but she did come to see us in Utah. We gave her a grand Doodlebug tour of the office and warehouse and she was such a delight to visit with. She is also a Doodlebug collector! And recently we just met Sabrina. At CHA Summer she cried in the booth when she met Cynthea. She told us she hesitates to use her stash too, and of course we tried our best to convince her to actually scrap with it! When we told Cathy about Sabrina, Cathy politely said that she was welcome to be the #2 fan, since she already held the #1 position. But we think they're all our #1 Doodlebug FANS! Thanks girls and we hope to make the fan club just a bit bigger!! Post one of our new Monster Mania badges above on your own blog and link back to Doodlebug, leave us a comment with a link back to your blog. Change your Facebook profile picture to one of these adorable badges and post a comment on our wall that you are the #1 Doodlebug Fan. 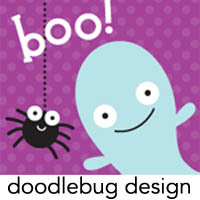 Leave the Doodlebug badge up until next week and we'll select a winner and post the winner on our blog September 1st. 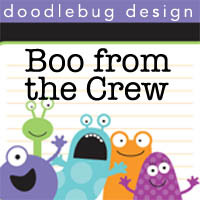 Thanks to all our great Doodlebug Fans out there...we appreciate your support! 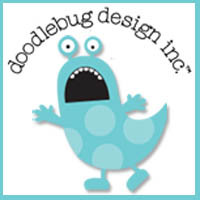 Only ONE week left to submit your applications for the first official Doodlebug Design Team. Deadline is 11:59pm MST, August 30th. 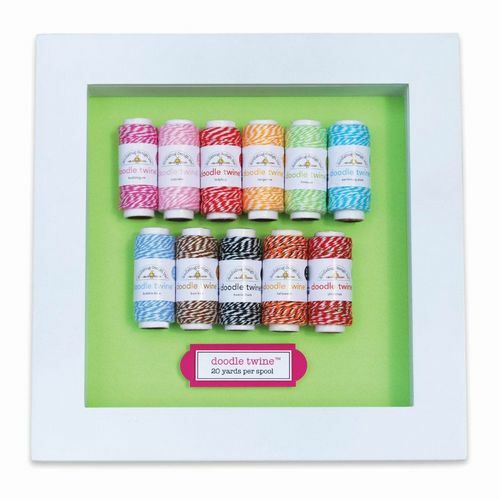 Although Doodlebug was one of the original manufacturers to premier their products in the industry years ago, they are still one of the premier scrapbook manufacturers offering papers and embellishments that stay true to the colors and style from it's origin. And we have been waiting for the right moment to introduce our new products to the world via new channels such as, designer blogs, facebook, twitter and so much more. The time is NOW! We want to interact with YOU and we're looking for designers that want to be part of this new goal and help us show the world why Doodlebug is still here, and will continue to be an icon for scrapbookers around the world. For application details, visit our original post here. 1. What if I cannot find Doodlebug products in my country? 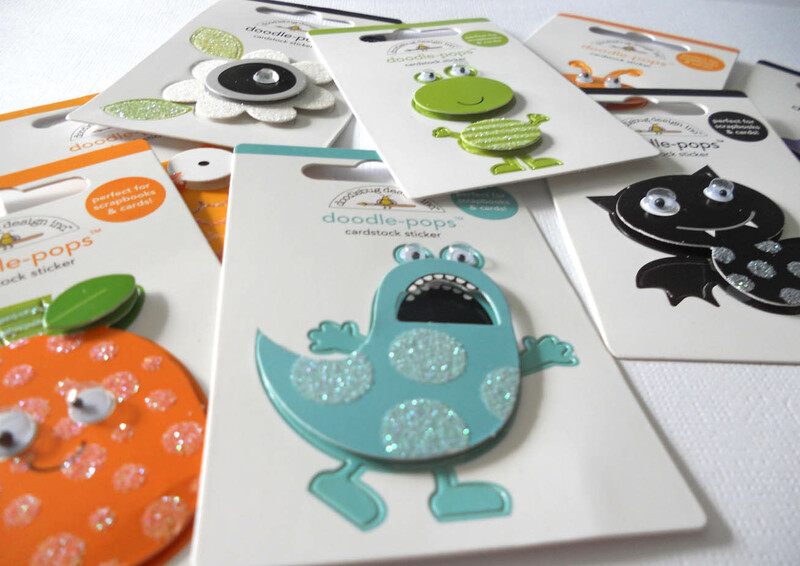 We will accept applications from those unable to locate Doodlebug products and will take into consideration that you weren't able to find product or order it online in time for the call. 2. 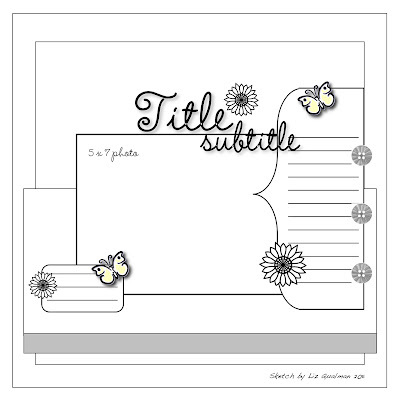 What if I am a card maker and not really a scrapbooker, can I still apply? Absolutely, simple indicate that on your application. 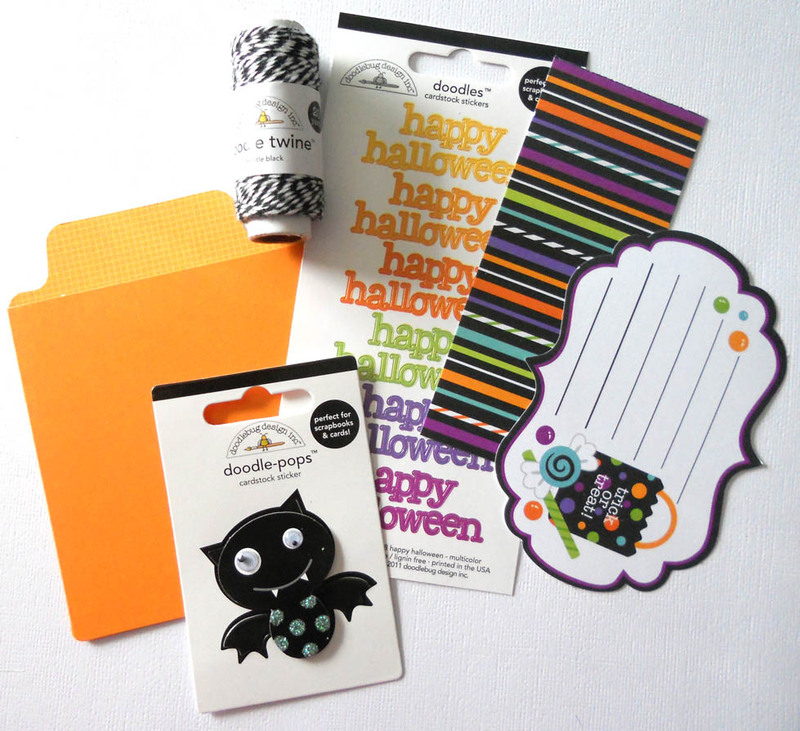 We always need good cardmakers for our new Create-a-Card product line. 3. What if I'm not very good at photographing my samples, should I still apply? We encourage everyone to apply, but good photography of your samples is essential for us to feature our products the best. So start practicing and even google tips on taking project photos. 4. Do I need a blog to apply? We would love everyone to apply for the team, blogger or not. We do encourage you to have your projects posted somewhere online for us to review for your application though. It's hard to get a feel for a designer based off only a few projects they emails, so we do go and review blogs and online galleries when considering team members. 5. Will you contact us if we are not selected for the team? No, sadly we have had a LOT of applications and we will not have time to contact each person directly. You will have to check our announcement to see if you made it or not...although all team members will be notified prior to the public announcement. 6. When will you announce who made the team? We are hoping to have our team selected and ready to announce the week of September 12th (or earlier). 7. If I am not selected for the team, would you consider me for a Guest Designer spot on your blog? Absolutely. We will keep all applications on hand and pull from them when we have an opening for a guest designer, but sadly not all applicants will be selected to participate. But our Facebook page is always open and we'd love to see you post your Doodlebug creations there anytime!! Last week we posted a great Doodles Sketch on our blog by Liz Qualman and we're very excited to announce the winner. Congrats goes out to Tere. 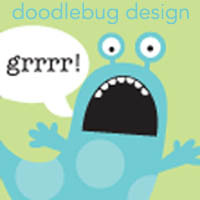 We'll be shipping her out some Doodlebug goodies soon!! Be sure to check back often so you don't miss future giveaways and great inspiration! There is nothing better then something soft and fluffy coupled with bright and fun! 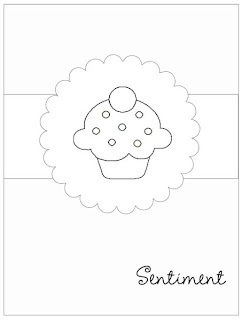 That's what we have when you combine the new Doodle Twines with the Petite Print papers and my Cricut machine. Here's a close-up of the project, but you can scroll down and see the whole project. 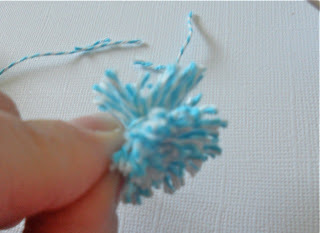 But first, I was so excited to share this new technique I learned, pom pom making!! I just received my first set of Doodle Twin and new this was the perfect project to create with using this fun product. 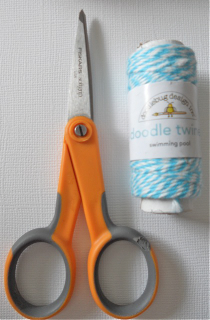 And I thought it would be fun to give you some sort of size reference, so these are my most favorite Fiskar scissors next to one of the new Doodle Twin Spools. 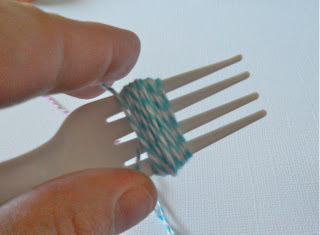 Isn't it the yummiest little spool of twine?? I saw this fun idea one day when I was surfing around Pinterest and have been dieing to give it a try with the new Doodle Twines. It's super easy and you'll love the end result. 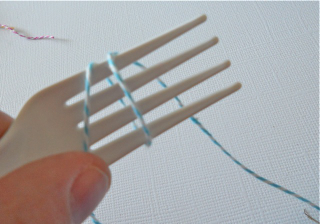 Step 1: Wrap twine around fork. Step 2: Wrap it 20-25 times around the fork. 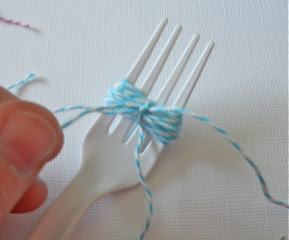 Step 3: Cut a small piece of twine and thread through center of fork and tie around both sides of twine and tie into square knot. 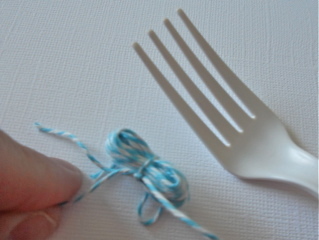 Step 4: Pull off fork and it should look like this. Step 5: Cut through loops and it should look like this...but wait you're not done. 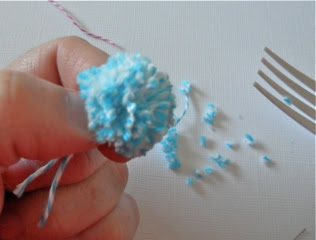 Step 6: Fluff pom pom as much as you can and then start trimming until it starts to take ball foam. 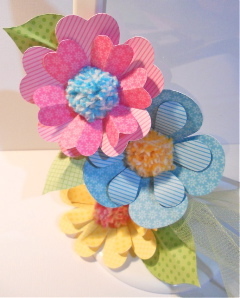 Here is used the new Flower Shoppe Cricut Cartridge to create these 3D flowers, which were perfect for my fun mini pom poms. Once they were assembled (see steps above), I simply threaded them through the center holes of the flowers and hot glued into place. I thought it would be fun to decorate this $1.00 frame from Ikea. 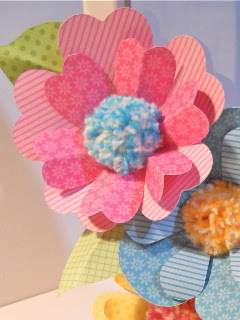 I didn't have a good photo or quote to add to the center yet, but the start of my craft is by far the fun pom pom flower centers. Let us know if you try this fun Doodle Twine Technique!! Post your pictures to our Facebook wall too and we can all enjoy your creations inspired by this post today. We had so much fun introducing you to our new Doodles sketch that we couldn't wait to do another one. So we invited one of our favorite designers, Liz Qualman to help us out with our Doodle this week. We challenged her with a 12x12 layout and not only did she accept the challenge, she even offered to create the Doodles sketch. 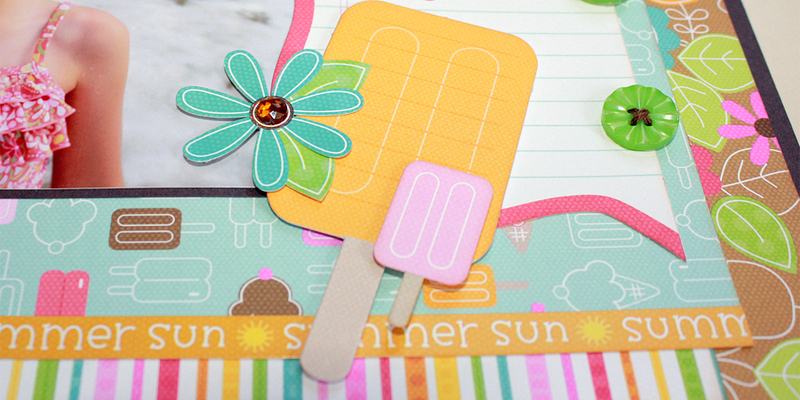 Here's her layout she created based on the Doodle sketch above using one of our Essentials kits. We loved how she incorporated the bracket journaling piece along with some fun stickers and sewn on buttons. 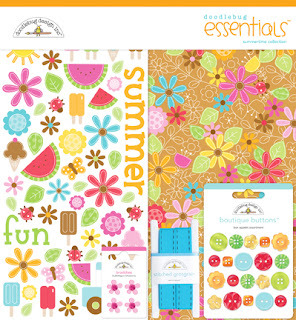 Supplies Used: Summertime Essentials Kit (all contents coordinate perfectly - contains coordinating embellishments, paper, stickers and cardstock). We loved how darling Liz's Doodle sketch turned out that we wanted to giveaway the same Summertime Essentials Kit to one of our wonderful fans. All you need to do is tell your friends about today's post (post a link on Facebook, Twitter or email your friends this blog post) and leave us a comment. For a bonus entry, be sure to visit Liz's blog and follower her blog and leave us a comment. We had a fun time yesterday celebrating with the entire Doodlebug team. It was a PARTY for Althea, Kathy, DD and Joe's birthdays. They're all such a great part of what makes Doodlebug a great place to work and we're grateful to celebrate another year with them. Happy Birthday! 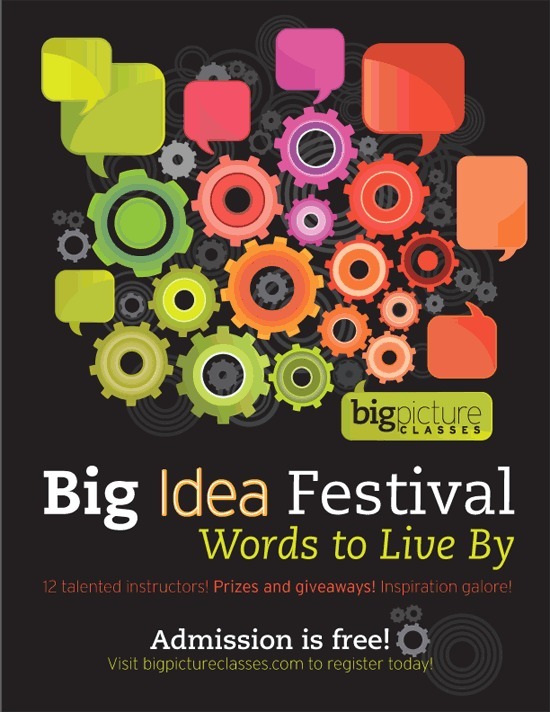 Some of our favorite people and other great, talented crafty gals have invited the Doodlebug fans to participate in a free class called Big Idea Festival: Words to Live by. 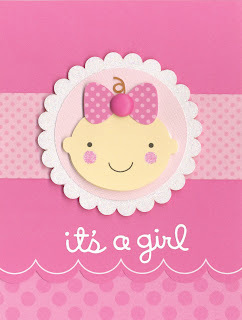 We combine a pink Polka Dot Create-A-Card base, Lily White Sugar Coated Cardstock of course one of our new Doodle-Pops (baby girl) and our new Doodles Cardstock sticker sentiments (it's a girl). This card came together in not time at all and with the help of our Doodles sketch it was super easy. Thanks for checking out of new Doodles feature!